The Crucible: Act I Opening: "My Betty be hearty?" The Crucible: Act I Scene 1: "Oh, good evening, Ann"
The Crucible: Act I Scene 2: "And speakin' of poppycock"
The Crucible: Act I Scene 3: "Forgive my coming"
The Crucible: Act II Opening: What keeps you?" 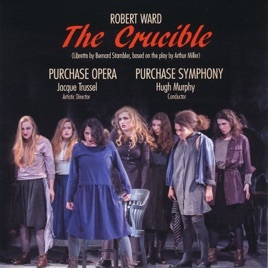 The Crucible: Act II Scene 1: "I do not judge you"
The Crucible: Act II Scene 2: "Mary Warren!" The Crucible: Act II Scene 3: "Mister Hale!" The Crucible: Act II Scene 4: "If she be innocent"
The Crucible: Act III Opening: "John, I knew"
The Crucible: Act III Scene 1: "Hear ye!" The Crucible: Act III Scene 2: "Come here, woman!" The Crucible: Act IV Opening: "The Devil say"
The Crucible: Act IV Scene 1: But, Sir!" The Crucible: Act IV Scene 2: "What word of the children?" The Crucible: Act IV Scene 3: "Oh, God be praised!"